Is it "Dominick the Christmas Donkey"? The Chipmunks' "Christmas Don't Be Late"? Gayla was ten years old when this novelty became a hit in 1953, and she even performed it on The Ed Sullivan Show. I just can't deal with her singing voice. And guess what? Gayla got her wish. An Oklahoma radio station launched a campaign to raise money to give her a hippopotamus for Christmas. She was presented with a hippo, named Matilda, which she donated to the local zoo. When Gayla was a little older, she performed under the name Jamie Horton and had a minor hit with "My Little Marine" in 1960. What holiday song bugs you the most? Amen sister! This song drives me nuts. And the worst part is, that once you hear it, you cannot get it out of your freaking head. It's utterly painful. 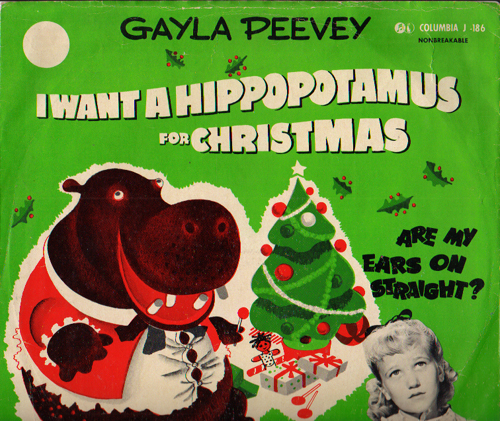 For the longest time my brother actually thought the words were "I want to BE a hippopotamus for Christmas"! 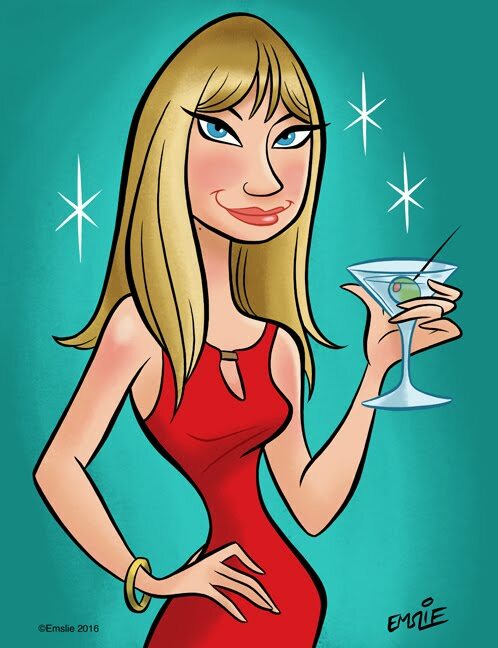 LOL, Chelly--her voice really grates on me, sorry to say. I kind of feel bad for the two little girls who are sharing the stage with her in that bit...one of them looks utterly bored and they're both just part of the scenery while Gayla struts her stuff. phairhead -- I like Dominick the Christmas Donkey better. Burl Ives singing Rudolph grates on my last nerve. I vote for Grandma Got Run Over By a Reindeer. I loathe that one. Burl Ives??? What have you been smoking, Pat? Amanda -- I don't like that one, either. It seems awfully mean to grandmas everywhere. Probably the "barking" version of Jingle Bells. It was cute when I first heard it 30 years ago. Not now. Also, radio stations flipping to all Christmas music earlier every year. I was already sick of Christmas songs by Thanksgiving (which goes back to a post Pam did earlier this year). Only if Nickelback were to cover it could a song be more unlikable. The only thing worse is the flip side of the 45 called "Are My Ears On Straight?" in which Gayla pretends to be a broken doll. I agree with the votes for "Christmas Shoes" and "Grandma Got Runover By a Reindeer" being bad. I blame the industry I work in, radio, for all of this. Radio used to rarely play Christmas music except on Christmas eve and Christmas day. A few years ago, some idiot came up with playing all Christmas music from November to December. Many times this is not to celebrate the holidays but to cover the fact that the large radio corporations are laying off the on-air staff. Merry Chistmas, Mr. Scrooge! Hippopotamus wins hands down. I never cared enough to see who sung this and I'm surprised to learn it was an actual child. I always figured it was some adult woman simulating a young girl's voice since it sounded so bad. That aside, the runner's up have to be The Christmas Shoes and A Soldier's Christmas in which Santa weeps over a Marine. Don't get me wrong, I've lost family to cancer and I'm all for supporting our armed forces, but who needs songs like these at Christmas time?! Not to be a rebel, but I kinda like this song! And I'm with Amanda (maybe it's a southwestern PA thing), but this song is holiday BLISS compared to that dang grandma song! I agree with you Doug. I like the song too, and I live in IL. The grandma song at first was annoying. Then I saw a cute video and some parodies of it and now love it as a satirical song. BTW, I am only 4'7" and loved "Short People". What does that say about me?!? Couldn't take it to the finish. Gayla would be a little more bearable with both nostrils unblocked, her offsiders don't have a clue or any sense of rhythm, and Big Ed must have been some sort of businessman because he sure ain't no showman. The latter thought is most definitely not original. Christmas stinker? That evil thing by the shortest shrillest Osmond. Mick -- Had no idea what "These Christmas Shoes" were, looked it up and saw it's a fairly new song that came out about 10 years ago. I didn't take the time to listen to it, and sounds like I shouldn't bother. JZ -- I have the cat equivalent cassette tape of that record you're talking about! Not once have I made it to the second song. I have to say the radio stations in my area didn't go berzerk this year starting the songs early. In fact, there are some that I enjoy that haven't been played yet. Gilligan -- Ha! Nickelback. One of those bands I assumed sounded cool from the hype until I actually heard them. Desdinova -- I tried listening to the B side song about the broken doll. Tried. Tom -- I could never tell if it was a boy or a girl singing the song until the DJ mentioned her name one day. I looked up the lyrics to "A Soldier's Christmas" and didn't dare listen to the song. Doug -- Well Doug, I guess you're the only one here who likes the song! Johnny Seagull -- You said it best, epic comment! Thanks everyone for your comments and happy holidays!